The falcons revealed their first egg of 2018 in the snowy nest box at 5.40 am on Sunday. 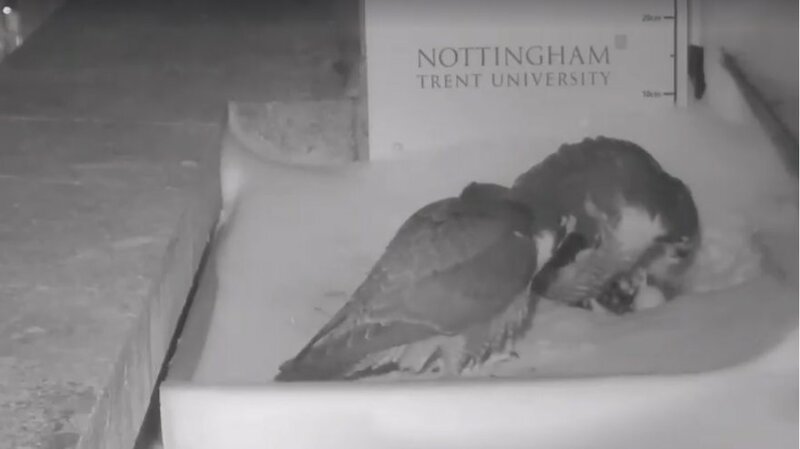 Nottingham Trent University's resident peregrine falcons laid their first egg of the year in the early hours of Sunday 18th March, just a day later than last year. It was first reported by the dedicated falcon watchers on the Facebook pages at 5.40am. Some people expressed concerns over the weather as thick snow covered the nest box over the weekend, but since the egg arrived the pair have been very attentive and take it in turns to keep it warm. Cameras have been on the nest since 2012 for security but they also provide valuable insight into the birds' behaviour, such as movement between nest sites. This will be the second breeding year with the new male peregrine who reared four chicks last year following the original male's disappearance in 2016. 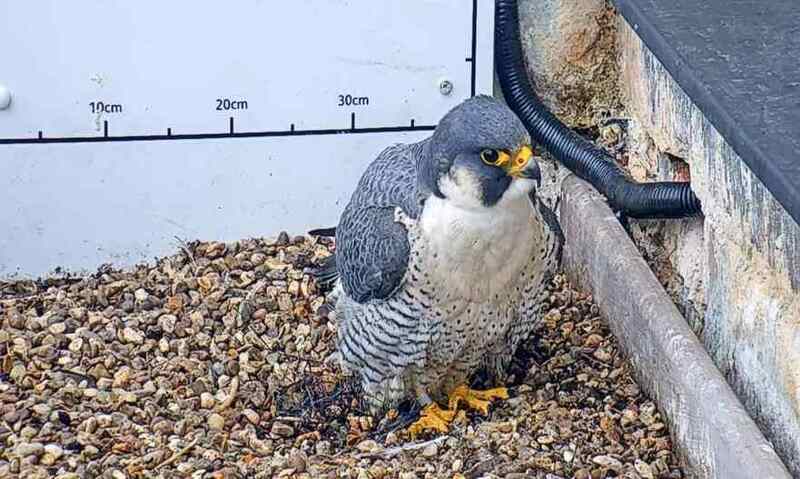 Falcons viewed on webcams in Woking, Bath and Fulham and Barnes have also laid eggs over the last few days. Our female (known as Mrs P by Facebook page members) usually lays 4 eggs, with each arriving 2-3 days apart so there should be plenty more excitement to come in the week ahead. Keep up with the action by viewing the cameras here. Many thanks to Nottinghamshire Wildlife Trust for their support with this project and for all the eagle-eyed watchers for the online updates!